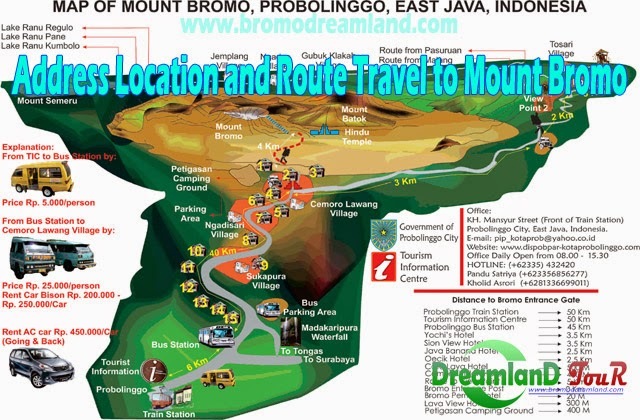 Address Location and Route Travel to Mount Bromo - For those of you who may still feel confused with the location of Mount Bromo, this time I want to strive to describe some of the routes you can take to be able to reach Bromo tourist sites. Location of 4 areas surrounding Mount Bromo in East Java districts covering, Probolinggo district, Regency of Malang, Pasuruan regency and district Lumajang. Location of Mount Bromo is actually quite easy to access because of road conditions that can be said good (paved). It would be much easier if you buy a package of Bromo because very recommend for your convenience in traveled towards Mount Bromo. Mount Bromo tourist sites would be much easier in access via Probolinggo, that time when I visited Bromo, I want to take the road which starts from Kediri. If you are from Kediri - Tulong Agung - Jombang could rise Harapan Jaya bus stop in the majors Surabaya and Mojokerto Terminal. Once up you have to look for a small bus to get to and then dropped in Pasuruan Terminal then you should look for another bus to get to the terminal Probolinggo. Takes approximately 3-4 hours if from the town of Kediri.After that you should look for Car Rental in Probolinggo to reach Bromo tourist area. To make it easier, I recommend to look for Dreamland Tour office which also sell car rental services, located near Kediri City, a distance of about 2 KM meters from the terminal and the address is Jl. Bunga, Gang Musholla Al-murshad. No. 1 Kediri, East Java. The easiest access is through big cities like Surabaya, if you are from Jakarta or Bandung or anywhere you are, can go to the city of Surabaya in advance by using aircraft / Railway / Bus. Once you get in Surabaya, look Purabaya terminal, but the Surabaya prefer to call it by the name Bungurasih and look for the bus that leads to the town of Probolinggo. 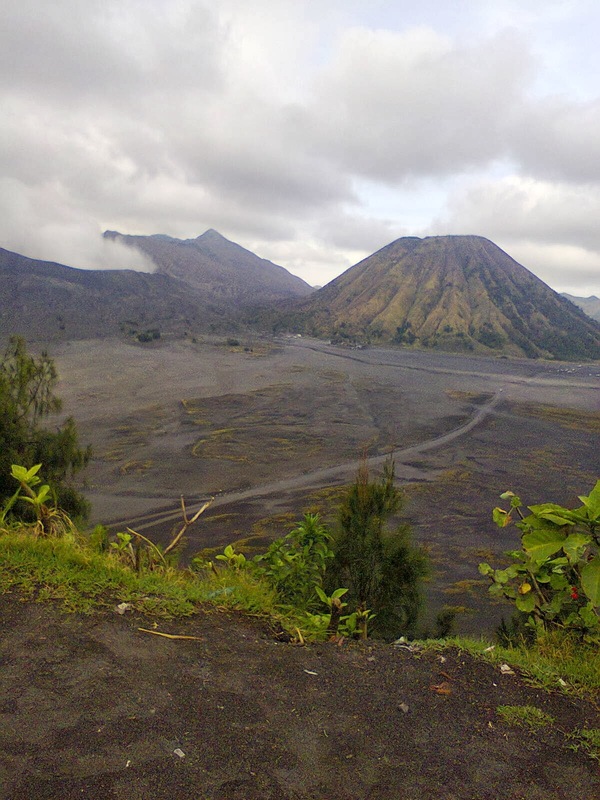 Once there, you can search for a car rental can reach Mount Bromo, because there is no public transport to Mount Bromo. recommendation of Dreamland Tour. Journey to Mount Bromo from Malang. Malang is the second largest city in East Java province, apart from the city of Surabaya, you can also access it from the city of Malang. Malang bus route - Pasuruan - Probolinggo.Still confused if it should be on the Bus? the solution is to buy a Package Tour Bromo is ready to pick you up from the airport / station / terminal is located in Malang or Surabaya and can give you more information on Bromo. 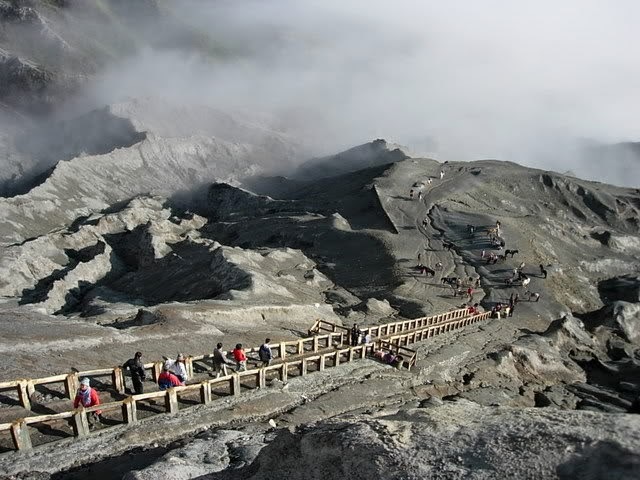 But Mount Bromo travel tips you will need. Plan your vacation well in advance and do not be impromptu because at Mount Bromo is quite difficult to find an empty, especially holiday time. 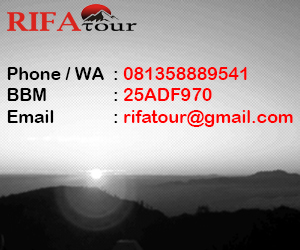 Full Address Location Mount Bromo, Bromo Tengger Semeru National Park, Ngadas, Sukapura, 67254 Probolinggo, Indonesia.